Measles first broke out in Williamsburg back in October, spread to Borough Park in November, and there are recent cases in Bensonhurst and Marine Park, bringing the total to 42 cases. In an effort to contain the spread of the highly infectious disease now the city is barring un-immunized students from attending local schools, the Department of Health. 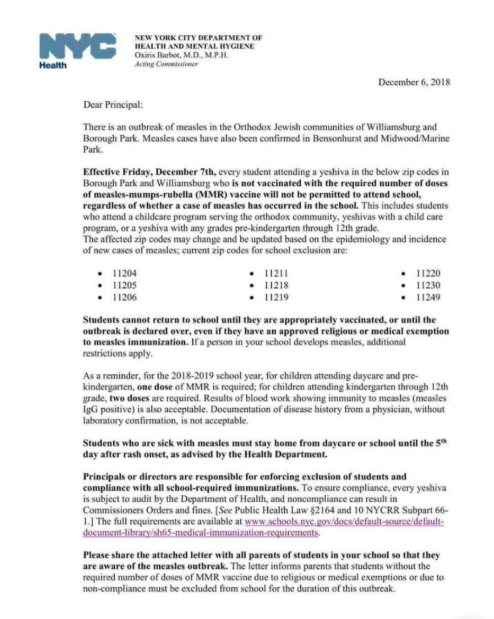 The letter, sent December 6, says Yeshiva students from pre-kindergarten through 12th grade will not be permitted to attend school unless they are vaccinated “with the required number of doses of measles-mumps-rubella (MMR) vaccine” whether they’ve been diagnosed with the infectious disease or not. New York City Department of Health and Mental Hygiene confirmed 42 cases on Monday within the confines of Williamsburg and Borough Park, where most of the boroughs ultra-Orthodox community lives. One case in Bensonhurst and another Marine Park were confirmed in late November. The recent case count is up from 27 cases confirmed November 21 and seven times the original 6 cases, first reported mid-October. The Health Department confirmed the Bensonhurst and Marine park cases are both associated with the Lakewood, New Jersey outbreak. A Department of Health letter to principles in Yeshiva schools barring un-immunized children to attend school. 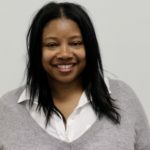 “Measles is highly contagious and really the best preventive measures we have to protect those at risk are vaccination of anyone we can vaccinate,” said Stephanie Sterling, MD, MPH, hospital epidemiologist at NYU Langone Hospital–Brooklyn. Sterling also said treatment for those who are immunocompromised is also available. Pregnant women or people undergoing chemotherapy can see their doctors for a “preform antibody” if they’ve been exposed. “I think the other thing I would say that’s really important to stop the rise of the disease, is to be aware of the symptoms and risk,” said Sterling. Symptoms: High fever (103F and 104F), a cough, sore throat runny nose and redness of the eyes. Within 2-4 days of the initial symptoms, people diagnosed with the infection will experience a rash. Sterling warned that during this time of year, many people confuse measles symptoms with those associated with the flu. One distinguishing factor is a rash which appears in measles cases sometimes tow to four days following the flu-like symptoms. However, Sterling advises anyone—especially living within the Williamsburg and Boro Park areas—experiencing any of the described symptoms should reach out to a physician immediately. The outbreak first came to the attention of the public when the Department of Health announced they’d start a measles awareness outreach after six children ages 11-months to 4-years-old in Williamsburg were diagnosed with measles. Officials say the original case contracted by a child visiting Isreal, which is currently dealing with a significant outbreak.